The view from the local house where we stayed. * Aangezien de mogelijkheid bestaat dat dit artikel gelezen zal worden door of andertaligen is dit artikel in het Engels geschreven. 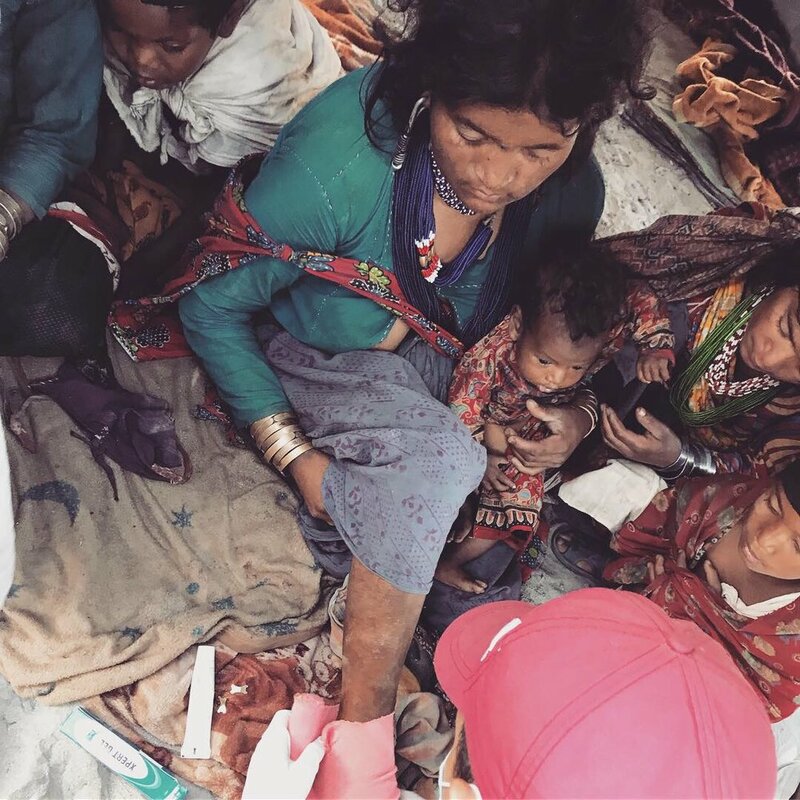 We brought another visit to the Nomadic Raute Tribe, unfortunately the last nomadic tribe from living in Nepal. The tribe is struggling with their existence as Governments try to make them give up their nomadic way of life. Beside this the environment of the tribe changes drastically over the last few years and their jungle is disappearing more and more. Our last visit to the tribe was 4 months ago. They shifted further south in to the district of Sukhet and are on their way to Dang district. We got a call from one of the leader after arriving in Nepal. A police officers talked with Samjhana telling a Raute leader asked him to call us on our number. Dhan Bahadur, one of the two Thalu leaders has been our closes contact from the beginning and he asked us when we would come to visit him again. He told us he got sick recently and got scared not been able to see us again. A week later we followed his instructions and traveled to the small village of Chiple in Sukhet district. Here we met them again in a changing state. Fractured ankle but she didn’t want to get an x-ray made as she and other never heard about it and where afraid. All came to see our treatments what made it easier to trace other Rautes with wounds or infections. While meeting the Raute again after 4 months we directly noticed that there where several Rautes with ear and eye infections. As always there where people with cut and burn wounds but mostly they would heal overtime. 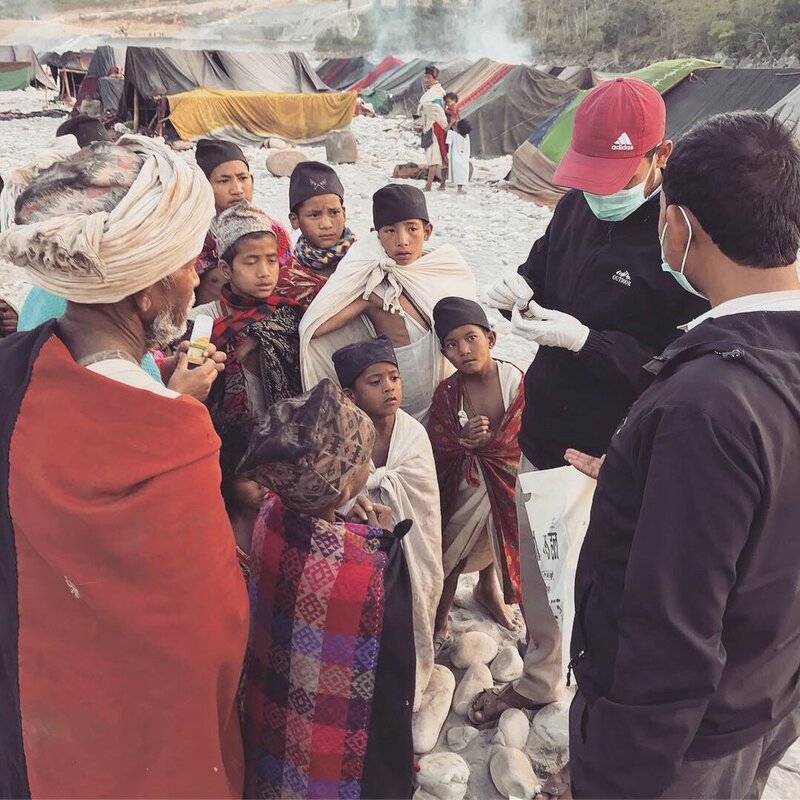 We knew the Nepalese government together with a collaboration of a few NGO’s with one of them Safe the Children, was assigned to take care oft he health of the Rautes. Durning our earlier visits we could only meet him ones and most of the time he wasn’t present. When we asked about him to his two colleagues, also assigned by the same project and budget, they told us he was working somewhere and would come. But we almost never seen him. The local doctor at work. After 22 treatments in one and a half hour we felt at least we could do something for the tribe. During our stay again we met the little boy who wanted to learn and become a tractor driver. This time we decided to try and do something with him. We asked the son of the family where we where having lunch and dinner and who was a drive of small moped or auto if he could teach some driving to the boy. He responded enthusiastically and the next day they started their drivers lesions. We would pay for the fuel and the driver would find the time for it. After his first lesson both where still very enthusiastic and we got told that he did very well in his first lesson and soon could drive himself. As the boy was still very little he needed a hand with the heavy steering. We wanted to let them have an idea that they could do and learn many things and beside their traditional way of living that could have future alternatives as long as they would be eager to learn them and work on their skills. Also we could take of two Raute friends to visit one of the biggest Hydropower projects in Nepal. They tried to get excess and a tour as they where very interested to see the project but the Chinese project leaders and their Nepalese staf didn’t allow them inside. We tried and with some persistence and telling we would guide over them and they wouldn’t cause any trouble we where taken on a tour inside. During the visit at the hydropower construction place. Rautes on the left and right looking with interest and asking clever questions about the possible damage to the fish in ‘their’ river.